Let me just say this – tonight is a night of stripping, tonight is a night of peeling away, layer by layer by layer by layer – What will be left? What will we know at the end of it all? Much less! That’s what! Dark Matter a performance from Kate McIntosh hosted by a woman in a spotlight, dressed in a sparkling dress and a long grey beard. With the help of two assistants, some small strange dances and a few materials you might or might not have at home, Dark Matter approaches the big scientific-philosophical questions in a full-on show-biz late-night theatre style, illustrating these knotty conundrums – time and gravity, being and not being, thought and the body – through what look suspiciously like a series of improvised home-science experiments. 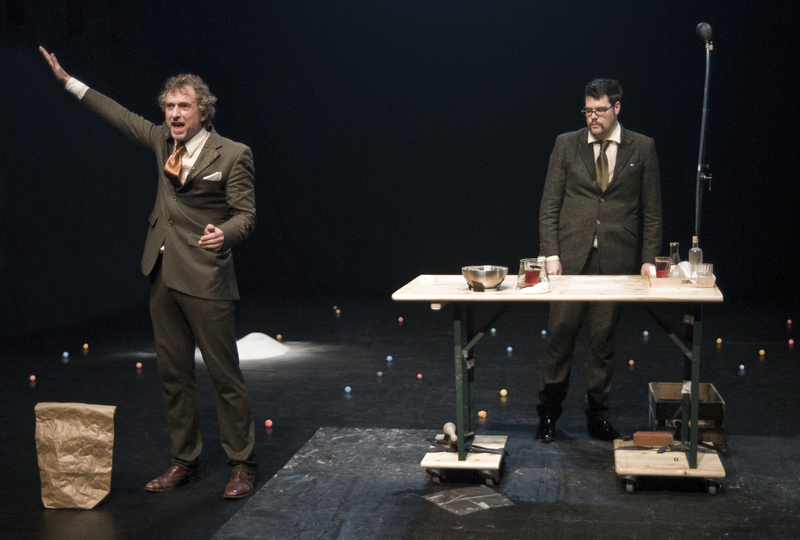 CONNECTIONS is a mentorship and production initiative of the theatre festival SPIELART Munich in Cooperation with CAMPO – Gent, Republique – Copenhagen, Forum Freies Theater – Düsseldorf, Theaterhaus Gessnerallee – Zürich, Huis en Festival a/d Werf – Utrecht, Choreographisches Zentrum NRW/PACT Zollverein – Essen, Theater im Pumpenhaus – Münster, Kanuti Gildi SAAL – Tallinn, The Student Center – Zagreb, Koproduktionshaus brut – Vienna.